Arrival at Bandaranaike International Airport. Pick up by one of our English speaking drivers, transfer to a hotel in Sigiriya. En route visit the Dambulla Cave Temple and lunch in Dambulla. In the afternoon climb Sigiriya Rock Fortress. If we have time village tour in Sigiriya. After breakfast 8 am leave for Kandy. En route visit a spice garden at Matale. En route visit the Royal Botanical Garden in Kandy. Visit a wood carving factory. Visit a Gem Bureau where you will be shown a documentary film on how Sri Lankan gem mining is traditionally done. Evening 5 pm witness the cultural show featuring various types of dances. Near to the auditorium is the Temple of the Sacred Tooth Relic of Buddha, and after visiting the show people go to the temple. After breakfast 8.00 am leave for Kitulgala for White Water Rafting. On the way visit hanging bridge with the village. 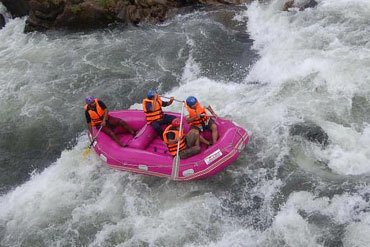 In Kithulgala the driver will arrange the rafting boat around 10 am. Lunch break at Ramboda Waterfall restaurant with a view to the waterfall. Check out from the hotel at 6.30 am with breakfast packages. Our driver will join the tour and arrange a jeep or a van to take you from Nuwara Eliya to Horton Plains. In the morning light around 8 am the hiking in Horton Plains to World’s End begins. After the hike around 11 am proceed to the Haputale Train Station where our driver will help you buy the right railway tickets. Lunch at a small restaurant before you catch the 1.15 pm train for a scenic and beautiful journey to Ella. The driver will in the meantime go back to Nuwara Eliya to pick up your luggage and take his vehicle and go to Ella. 3.30 pm at the Ella railway station our driver will pick you up and take you on a city tour in the small mountain village Ella. Around 4.30 checking in to the hotel in Ella. If you would like to have dinner in Ella town, our driver will drop you in Ella town. Taxi back to the hotel is around 200 rupees. Check out from the hotel in Ella 8.30 am and proceed to Udawalawa. 10.30 am start the jeep safari in Udawalawa Ntional Park. After the jeep safari proceed for lunch in Tissamaharama. Checking into the hotel around 3.00 pm. Evening 6.00-7.30 pm, commence city tour of Kataragama including the Katragama Hindu Temple and see the pooja (a prayer ritual performed by Hindus). Overnight stay at a hotel in Tissamaharama. Pick up at Your hotel 5.30 am for an early morning wild life experience with jeep safari in Yala National Park. Around 9.00 am back to the hotel for breakfast. After Breakfast leave for the South Coast. Our driver will drop You at the hotel on the south coast where You wish to stay for Your beach holiday. For example Mirissa, Unawatuna, Hikkaduwa or Bentota after Your choice. The south coast hotel is not included in the price, but we will be happy to arrange it for you. This price includes an extra bed and breakfast for 1 child below 5 years. Price is approximately and pr. person pr. day. Please send us an email, to get a quote for your exact tour. Expenses of personal nature such as tipping, porters, laundry, telephone. If you choose one triple room prices is relevant to 3 adults package. If you choose two double rooms price is relevant to 4 adults pacakage. Most of the hotels and guest houses in Sri Lanka don’t have triple rooms and family rooms or only have a few and they are often quickly sold out. Therefore we can not guarantee to provide these rooms. 0-5 Years breakfast free of charge. Extra bed for a child around 15 US$ pr. night. At Your arrival, a Fernando Tours driver will be waiting in Colombo Airport with a Fernando Tours sign or a board with Your name on. In some of the tour plans lunch in a certain place is mentioned. Expect a lunch at these locations to cost around US$15 per person. Group travels with more than 6 persons can be arranged, please contact us for a price tailor made for your group. All prices mentioned are approximate. Fernando Tours reserves the right to any price changes and shall not be liable for any printing errors, lack of updates, or price changes for example due to seasonal fluctuations, increased hotel expenses, car hire etc. When You decide to book a round trip in Sri Lanka with Fernando Tours, You will be asked to pay the deposit to our bank account before we start booking hotel rooms, driver, car etc. The deposit will be part of the price, and You will be asked to bring the rest of the money in cash and US$ and pay to the driver on the first day of the tour. The deposit will be used to cover the expenses of eventually cancelled hotel rooms, drivers, cars etc. and can therefore not be refunded in case of cancellation of a trip.